The diagram to the right shows a single stage MOSFET tuned amplifier which may be used as a preamplifier, RF or IF amplifier. Depending on the frequency of operation, the gain will be from 15dB to 30dB - higher gain at lower frequencies. Decoupling values are typical for operation on the HF bands. Two bias options are shown - use A if AGC is not required and B if AGC is required. The no-signal AGC bias should be around 4-5V - check the data sheet. The tuned frequency will be controlled by L2 / C1 and L3 / C2 and for most purposes these can be made the same value, I.e. C1 = C2 and L2 = L3. The capacitors used for high impedance coupling applications will typically be significantly less than the values of the tuning capacitors C1 and C2. Additional RF selectivity may be implemented by using a multi-section bandpass filter instead of the single tuned circuit that is shown. The low impedance points will be determined by the turns ratio of L2 : L1 and L3 : L4 which would typically be between 7:1 and 10:1 for a 50 ohm environment. If this amplifier is required to be manually tuned from a front panel control then C1 and C2 should be variable and ganged together with C2 connected between drain and ground instead of as shown - a DC isolating capacitor may be used if required. 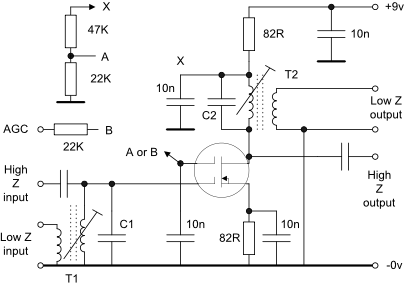 If this amplifier is to be used ahead of the crystal set shown elsewhere on this site then the tuned circuit comprised of C2 / T2 should be replaced with an RF choke and the High-Z output connected to the tuned circuit in the crystal set. C1 should be ganged to the tuning capacitor in the crystal set. Keep the input and out circuits apart and if necessary, put a screen between the two to ensure stability. The inductors may be mounted in screened assemblies. 2. As the 40673 is now very difficult to obtain it may be substituted with another type of dual gate MOSFET including a more modern device like the BF960.- in this case check the operating characteristics to ensure that the voltage and current ratings are not exceeded. Alternatively a cascode circuit using a low noise n-channel JFET and an NPN bipolar device may be used as shown below. The gain is typically 33dB at 9MHz and the Hi-Z output starts to clip at 4.5v pk-pk on a 9v supply and 7.2v pk-pk on a 12v supply. During tests, some UHF instability was noted which did not seem to be greatly affected by circuit layout or decoupling so a ferrite bead was put onto the emitter leg of the NPN device which cured the problem. An IF amplifier consisting of three of these stages was constructed on a double sided PC board and produced about 100dB of gain at 9MHz. Care is needed with the layout to ensure stability. Additional selectivity or filtering may be required to reduce the wideband noise at the output. The biasing may need to be adjusted for different supply voltages.